Well it's that time again. 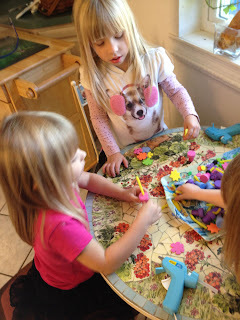 This will be the 3rd Crafting with the Kids Challenge. I thought it only fitting with Spring Break right around the corner that our theme this month be flowers. To change it up a bit the material used can be anything. Fabric, foam, silk, paper, icing.... let the kids decide. We always spend part of Sunday at Nana's house. Nana usually always has a craft set up for the girls to do. They've made inchworms, butterflies, owl books, a 3 foot tall Grinch, crowns... and the list goes on. 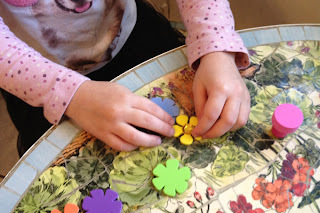 This past week they were given a bag of foam flower pieces and had a ball assembling the flowers. This one was easy enough for the twins to do by themselves. Jilly need a little help holding it all together. Here are some photos of the assembly. Choices.. .Choices.... So many to choose. You have to have bling! These actually made great little gifts. Both girls took one to their PreK teachers this week. Now it is your turn. Get your kids and create something crafty with flowers. It can be using any medium for any occasion. The listing will close on Sunday, March 18th﻿. Blog about it or post a photo in an online gallery and link up by then. Please spread the word and have fun! 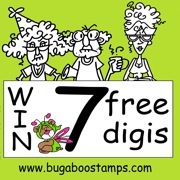 I will randomly choose a winner that will receive 7 free digis from our sponsor Bugaboo Digi Stamps! What a great craft! Love the pot for the flowers! 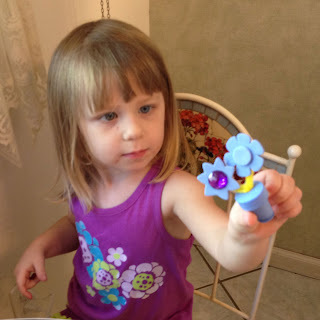 We will definitely get to work on our flowers craft....maybe I can get them to make me a bouquet for my kitchen table.